Making a trip from your bed in darkness can be a grim reminder that the family dog is content to sprawl out anywhere. If confining your dog to a crate is no longer necessary during the night, provide him a comfortable bed of his own to effectively keep him safely out of your darkened path. 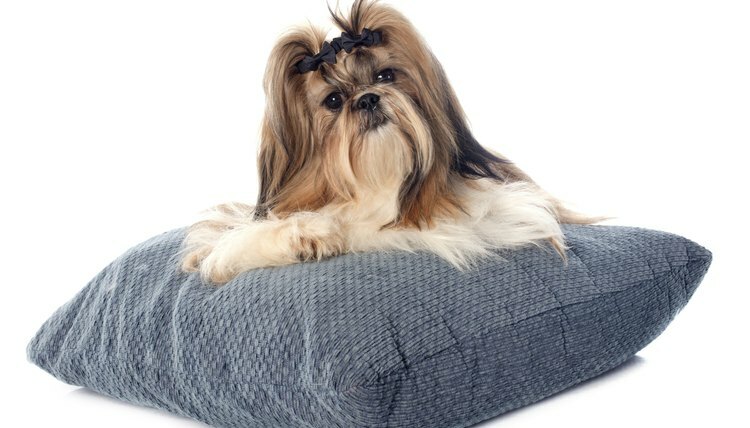 A DIY dog bed from recycled pillows keeps useable things out of the landfill; you can tailor one to match your décor. Wash and dry the bed pillows you've chosen to recycle into a dog bed. Choose your fabric. You'll need a piece of fabric at least 70 inches by 48 inches if you're using two 20-by-26-inch standard-size bed pillows, which when sewn together will create a 40-by-26-inch pillow foundation. Choose a heavy fabric that is likely to withstand some pouncing by the family dog. Pin the long side of your pillows together. You'll be taking two rectangular pillows, placing them longwise side by side, and pinning them where they meet. Using needle and thread, hand-sew your pillows together at the pinned seam. This seam will be covered by fabric, so neatness isn't a big necessity but making sure the seam stays together is. Push your threaded needle down through the fabric, making sure you pierce through all the fabric in the seam, then push it back up and through a little further up the seam. After you've sewn the whole length of the seam, you may want to go over each stitch a second time to strengthen the seam. Lay your fabric out with the wrong side of the fabric facing down. Lay the short length of the rectangular sheet of fabric across the table side to side and the longer length front to back when you're facing your work space. Lay your pillows on top of the fabric, with the sewn seam of the twinned pillows front to back on your work space, as opposed to side to side. Fold the fabric over the pillows. Fold the piece on the other side of the pillow toward you, and then fold the fabric closest to you over the top of the other piece. You'll be creating a fold-over pillowcase, which has an opening that runs down the center of the back of the pillow, as opposed to a standard pillow case that is open on one end. Overlap the fabric by 8 inches. Pin along the edges of the pillows, creating a pinned seam vertically. Cut along the pinned seams, on the outside of where you've pinned, using the scissors. Fold and pin a 1-inch hem on your fabric pieces -- fold it over twice so no rough edges remain. Hem each end where your fabric ends will overlap. Remove the pillows and sew the seam using your sewing machine. Pin one outer seam using the pillows as a guide. Pin the other seam, making sure it matches up with the first seam you pinned in step 13. Sew the seams using your sewing machine. Remove the pins, trim the seams to a half-inch, and turn the pillowcase right side out. Insert your pillows into the finished fabric cover. Choose a fabric that complements your existing décor. Keep scissors, needles and pins away from children and pets.